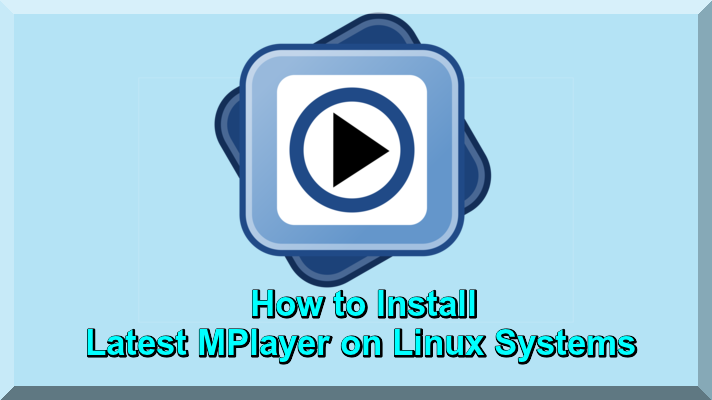 By this useful article I guide you that how to install latest MPlayer on latest linux basis systems such as Latest Linux Mint, Latest Ubuntu. This Player is is a free software and open source Media Player. Primarily MPlayer was called as a “Movie Player” for Linux and later this player was very famous and it is on stage its condensed to “MPlayer”. MPlayer also available for all major computer operating systems, such as, Windows, Mac OS, and Linux. This Video player widely support for most of the Audio & Video formats such as like MPEG/VOB, AVI, QT/MOV/MP4, Matroska, Ogg/OGM, VIVO, ASF/WMA/WMV, RealMedia, NUT, NuppelVideo, FLI, YUV4MPEG, FILM, RoQ, PVA files. By default Mplayer value with any own GUI but around 50 external Mplayer’s fronted available and SMPlayer is best fronted for Mplayer. If you want to know about Mplayer Features, Supported Input Formats, Video and Audio Codecs, Video Output Devices & Audio Output Devices Navigate to Mplayer you can visit their website. Recently latest version of Mplayer 1.3.0 has been released which is compatible with the recent FFmpeg 3.0 and other great features and formats. You can also Install MPV Player, VLC Media Player, SMPlayer, sView stereoscopic 3D Video Player, for Linux Basis Systems. Now how to install MPlayer on Latest Linux Mint, Latest Ubuntu, Latest Debian to use the following command in terminal. How to install Mplayer on Old Fedora Linux versions to use following command in terminal. I hope this article is very useful for you like other Linux tutorials.